Shopping in historic Lahaina town has become uncomfortable as cosmetic vendors aggressively try to sell their products on the narrow sidewalks, according to residents and visitors. The complaints have led West Maui state Rep. Angus McKelvey to introduce resolutions in the Legislature calling for Maui County to ban predatory cosmetics stores from doing business in Lahaina. The measures describe the marketing practices as disrespectful, inconsiderate and aggressive, and that they “negatively affect the health, safety and welfare” of the community. Resolutions have been passed by the House and referred to Senate committees. Regulating cosmetics stores and their sales practices is a county responsibility, and in 2015 the county and the stores signed a memorandum of understanding. The agreement essentially said that salespeople may communicate and offer samples to passersby on public property as long as they remain on private property. The storefront door is considered the boundary for salespeople. McKelvey was critical of the agreement, calling it “weak,” poorly regulated and constantly violated. County spokesman Chris Sugidono said that the county and police have not received any complaints recently and do not have increased enforcement proposals in the works. Police and Planning Department officials make frequent checks to ensure vendors are complying with the settlement and with Historic District zoning laws. “They may not grab a person, but they can offer them samples, which includes extending an arm out from where the employee is standing to hand the sample out,” Sugidono said. “If someone, a cosmetics store or other commercial enterprise,” were to grab someone on the sidewalk, “then it would be a zoning violation that the Planning Department can enforce,” he said. 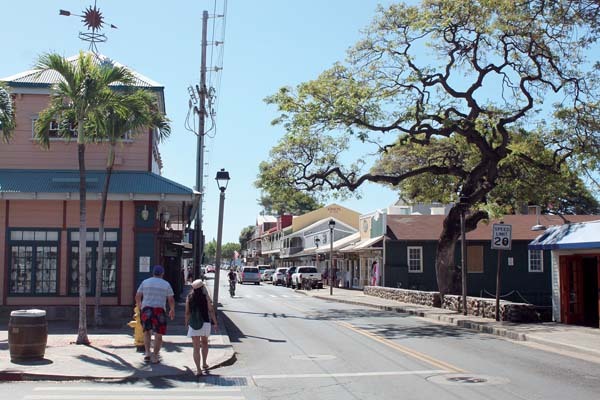 Zoning inspectors can issue citations for acts of predatory cosmetics sales in the Lahaina Historic District, Sugidono said. According to the Maui County Code, violations in a Historic District could result in fines of as much as $1,000 a day. McKelvey said that there needs to be a crackdown on violators of Historic District zoning laws, which he hopes would incentivize landlords to address their tenants’ actions. Most employees of the cosmetic stores in Lahaina town declined to comment during a visit late last month by The Maui News to Front Street. The exception was Oree Klachkin of Prestige Ocean Beauty, who said that there is a misconception about their sales techniques. Their employees are following the law and support local businesses. “We are very nice all the time on the streets,” said Klachkin. “We’re just trying to provide for our families and for ourselves, so sometimes it seems aggressive, but it’s not. It’s how we work. . . . We work hard, but we always try to be polite to people. Klachkin did not want to be negatively labeled by what other stores are doing. The Maui Police Department said that those who experience or witnesses predatory behavior should document the incident and contact MPD’s nonemergency number at 244-6400. * Dakota Grossman can be reached at dgrossman@mauinews.com.